National Donate Life Month (NDLM) was instituted by Donate Life America and its partnering organizations in 2003. Celebrated in April each year, NDLM features an entire month of local, regional and national activities to help encourage Americans to register as organ, eye and tissue donors and to celebrate those that have saved lives through the gift of donation. For the 2016 National Donate Life Month artwork, Donate Life America was inspired by the mighty sunflower. It’s difficult to overlook their stature and bright color. A sunflower’s orangey yellow hue evokes feelings of optimism, warmth and cheerfulness. Often found in fields, they stand confident, sheltering each other and following the light throughout their lives. Look a little closer and you will notice that one sunflower’s face contains as many as 2,000 seeds. With these, it has the potential to create an entirely new field of flowers. We each have a similar potential to give life when we register our decision to become an organ, eye and tissue donor. One organ donor can save and heal the lives of up to eight people through organ donation and countless others through tissue donation. A chance at new life gives beyond the recipient. Just as a new field of sunflowers brings comfort and happiness to those that come into contact with it, so does a loved one’s gift of donation to his or her family and friends. Through life and its struggles, the sunflower reminds us to lean on each other and embrace the life-giving aspects of our lives. It reminds us to live with joy, to focus on the light even during difficult times, and to give freely to save the lives of others when we are gone. We wish you a Happy National Donation Life Month. 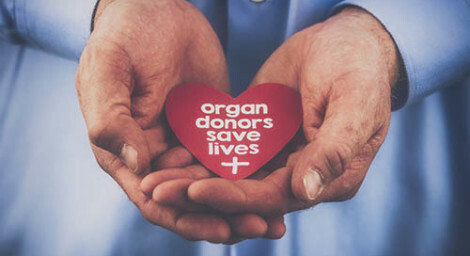 Thank you for your efforts in educating and registering others as organ, eye and tissue donors! • More than 1 million tissue transplants are done each year and the surgical need for tissue has been steadily rising.